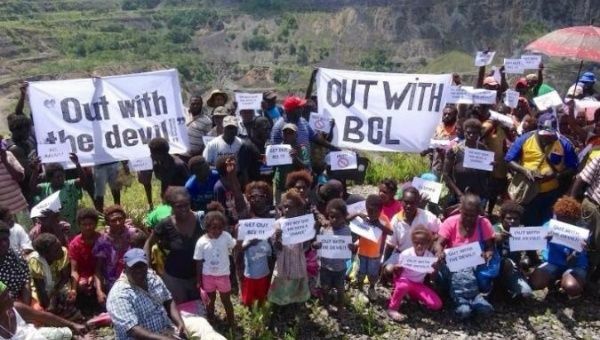 The Bougainville Government is holding a crucial mining warden’s hearing at the abandoned copper mine which sparked a decade-long armed insurgency against the Papua New Guinea Government. The Bougainville Government now owns part of Bougainville Copper Limited and wants it to redevelop the mine, but a rival consortium is challenging their bid, and said it has the support of key landowners from Panguna. RTG’s chairman Michael Carrick said the group’s proposal was more realistic and better-supported by the people of Panguna. RTG Mining has told the Bougainville Government that BCL’s exploration licence for Panguna has expired and legally cannot be renewed. “For the first time in 30 years a mining company has been endorsed and supported by the SMLOLA,” Mr Carrick said. “The legacy issues for BCL are insurmountable,” Mr Carrick said. He said the landowners would present a 2000-signature petition in opposition to BCL. RTG Mining said the dispute had been settled with their preferred candidate, Philip Miriori, in charge; the Bougainville Government said the mediation had failed and that the matter is still before the courts. The Bougainville Government has also criticised the consortium for paying landowners who support them and implied it is not respecting the approval process. Michael Carrick from RTG Mining says the consortium has been dealing openly with the Bougainville Government and that landowner payments are wages for its employees. “The joint venture is a commercial operation and landowners, like anyone else, are able to work and to get paid for their services. Mr Carrick said the intent of the travel ban against Mr Duncan appeared to be to help Bougainville Copper Limited. Bougainville Copper Limited is deeply unhappy with RTG Mining and its partners. He said BCL’s licence application was legal, and wasn’t processed on time because the Bougainville Government wasn’t ready to implement the processes of its new Mining Act. Bougainville’s Mining Secretary Shadrach Himata said all landowners will be asked for their views as part of the approval process, not just the leaders of the association. “Right now, the only legal applicant on the exploration tenement is BCL,” he said.